I had the same Kodak camera, that definately brings back some memories. The first digital camera I ever used was a Sony FD71. A friend graciously allowed to use it for almost an entire week at a kite festival. 640x480 resolution and it used 3.5" floppies for storage. I was hooked. When the Sony FD91 came out I had to have one. It seemed perfect: 14x zoom, 1024x768 resolution and a lot of 'real' camera features. It also used floppies for storage. The massive images only allowed 7 or 8 on each disk. It was perfect if you had a jacket with two large pockets. One for full disks and one for blank disks. You could stay out and shoot for hours. When the Sony CD1000 came out I upgraded. This was still before DSLRs and it was the most advanced camera around (for a month or two anyways). The CD1000 had a 1600x1200 resolution and the images were dazzing. It used 3" CDRs for storage. The disks held several hundred images. It had a 10x zoom and met my needs for quite a while. Each of these two Sony's were around $1200. I gave the FD91 away. Sony had a pretty good idea with these two - it was so easy to share. Snap a picture and hand them a disk. No drivers or cables needed. They were universal. I still have the CD1000. It's still useful for images that are intended for the web. I'm holding onto it for now, but may give it up if I can find a good home for it. My first real camera was a Canon A1 (film) and I have heard the call to come home (still have the A1). I have really enjoyed my 30D the last year or so. Ironically the 30D was the same price as the old Sonys. Wow, do I feel like a Luddite compared to you guys! First digital was a 1999 Olympus D-340R. I think I was waiting for the cost of a megapixel camera to come to Earth before taking the plunge. It was great to hear this podcast, I didn't get my first digital until 2001, so I didn't have the original "experience" of making the drivers work etc. I started right off with a Smartcard and a card reader. The perspective of someone who used the camera originally and still finds enjoyment coming back to it is really interesting. A great story. We'd love to have any photos taken with the DC20 (or any other old digital cameras) added to the Vintage Digital Group on Flickr. My name should link to that group. We are just checking out our new KODAK M893 IS camera! 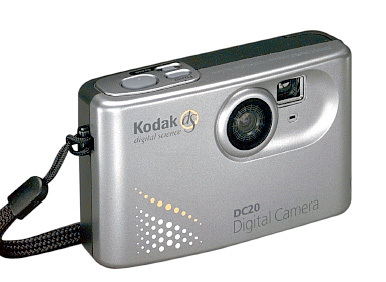 I have the Kodak DC20 with the box, CD ROm software included. I am considering selling it. It has hardly been used. Looks like new. How much would this camera be worth?